"I Was Cut Out To Be What I Am; Bo Diddley..."
A brief history of notable milestones in his career. Checker Records release BO DIDDLEY'S debut record "Bo Diddley"/"I'm A Man"; it climbs straight to the top of the R&B chart and "I'm A Man" is later awarded a Broadcast Music, Inc. (BMI) Rhythm & Blues Award. The record is now universally acknowledged as one of the cornerstones of rock music and one of the most influential two-sided debut singles in history. "Bo Diddley" is covered by Jean Dinning, by Jerry Murad's Harmonicats, by Joe Reisman & His Orchestra & Chorus and by Bonnemere & His Piano. Retitled "Mannish Boy", "I'm A Man" is covered by Muddy Waters and is a Top 10 R&B chart hit. BO DIDDLEY appears on CBS-TV's "The Ed Sullivan Show"; now universally regarded as one of the very first rock & roll performances on TV. He records his classic songs "Diddley Daddy", "Pretty Thing", "Bring It To Jerome" and "Diddy Wah Diddy". He writes and plays guitar on Little Walter & His Jukes' R&B chart hit "Roller Coaster". A young Bobby Hebb, later to find fame as singer/songwriter of the pop standard "Sunny", joins Little Walter and The Moonglows in studio sessions for BO DIDDLEY's second record release "Diddley Daddy"/"She's Fine, She's Mine". He headlines the nationwide "Diddley Daddy" tour, with artists including The 5 Keys, Nappy Brown, Al Hibbler, The Moonglows, Dakota Staton, Dinah Washington, Little Walter and Ella Johnson with the Buddy Johnson Orchestra. He makes his debut at the world-famous Harlem Apollo Theater in New York, with artists including The 5 Keys, Charlie & Ray, The Hearts, The Spaniels, Claudia Swann, Big Joe Turner, Dolores Ware and the Buddy Griffin Orchestra; Elvis Presley was later to watch one of his Apollo attendance-breaking performances. He embarks on Lou Krefetz' "Top Ten Fall R&B Revue" tour, including an appearance at New York's prestigious Carnegie Hall, with artists including The 5 Keys, Faye Adams, Charlie & Ray, The Charms, The Clovers, Bill Doggett, Gene & Eunice, Etta James & The Peaches, Big Joe Turner and the Paul Williams Orchestra. He appears once more at the Apollo Theater in New York, with artists including The Bill Doggett Trio, Etta James & The Peaches, The Flamingos, The Harptones, The Heartbeats, Howlin' Wolf, The Jacks, Dakota Staton and Willis "Tail Gator" Jackson & His Orchestra. He ends the year playing on Dr. Jive's "Christmas Week Show" concert series at the Brooklyn Paramount Theater in New York, with artists including The 4 Fellows, The 5 Keys, Pat Boone, Ruth Brown, The Cheers, The Flamingos, Clyde McPhatter, Shirley & Lee, The Turbans and Willis "Tail Gator" Jackson & His Orchestra. 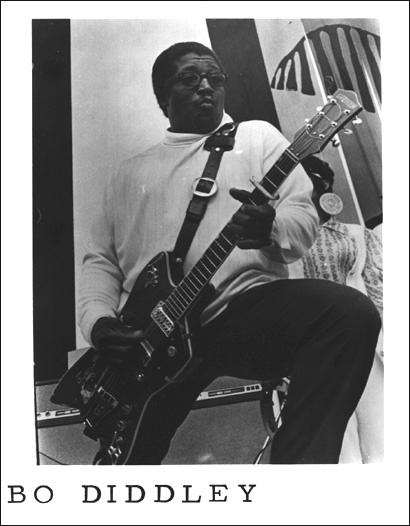 BO DIDDLEY writes and records his classic song "Who Do You Love"; one of his most popular and enduring compositions. BO DIDDLEY co-writes the song "Love Is Strange" with Joe "Jody" Williams for Mickey & Sylvia; a hit for them and for the Everly Brothers in 1965 and for Peaches & Herb in 1967 and for country singers Susan Raye & Buck Owens in 1975. An influence on later artists including Jimi Hendrix and Buddy Holly, "Love Is Strange" ushers in the "Malt Shop Era" and is later awarded a Broadcast Music, Inc. (BMI) Pop Award, a BMI Rhythm & Blues Award and BMI Million-Air status for accumulating at least 1 million US radio and TV performances. He embarks on Irvin Feld's "Super Attractions" tour, with artists including The 5 Keys, LaVern Baker, The Drifters, Bill Haley & His Comets, Roy Hamilton, The Platters, Shirley & Lee, The Turbans, Big Joe Turner and the Red Prysock Orchestra. He performs at Chicago's Park City Bowl, with artists including The Clovers, The Drifters, Ben Webster and Al Smith & His Orchestra. He appears on Dr. Jive's "Easter R&B Revue" concert series at the Apollo Theater in New York, with artists including Dean Barlow, Brook Benton, Charlie & Ray, The Fi-Tones, The Heartbeats, The Moonglows, The Schoolboys, The Solitaires, Sugar & Spice, Claudia Swann, The Teen Queens and the Buddy Griffin Orchestra. He performs on the "Rock & Roll Jamboree Show" at the International Amphitheater in Chicago, with artists including LaVern Baker, The Colts, The Drifters, The Flamingos, Bill Haley & The Comets, Frankie Lymon & The Teenagers, Clyde McPhatter, The Platters, The Teen Queens, Big Joe Turner and the Red Prysock Orchestra. Rockabilly quartet The Teen Kings, featuring a young Roy Orbison on vocals and guitar, perform a live version of his song "Bo Diddley" on KOSA TV station in Odessa, Texas. He embarks on the "The Biggest Rock & Roll Show of 1956" tour, which takes him overseas to Australia for the first time, with artists including LaVern Baker, The Colts, The Drifters, The Flamingos, Bill Haley & His Comets, Frankie Lymon & The Teenagers, Clyde McPhatter, The Platters, The Teen Queens and Big Joe Turner. Chess Records release Billy Stewart's "Billy's Blues (Parts 1 & 2)", with BO DIDDLEY on guitar. He embarks on Alan Freed's "Big Beat of 1956" tour. He appears on Dr. Jive's "Labor Day Week Show" concert series at the Apollo Theater in New York, with artists including The 5 Satins, Big Maybelle, The Channels, Charlie & Ray, The Clovers, Butchie Saunders, Claudia Swann and The Valentines. He appears once again on Dr. Jive's Show concert series at the Apollo Theater, with artists including Annie Alford, The Cadillacs, The Chips, Ann Cole, The Debutantes, The Dells, Screamin' Jay Hawkins, The Heartbeats, Robert & Johnny, The Schoolboys, Young Jessie and the Reuben Phillips Orchestra. He ends the year with a show at Detroit's Fox Theater, with artists including The 3 Chuckles, Ivory Joe Hunter, The Nightcaps, Bunny Paul, Della Reese and The Serenaders. Chess Records relocates its studios to 2120 South Michigan Avenue in Chicago. 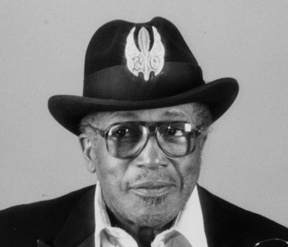 He records his classic songs "Hey Bo Diddley" and "Mona". He discovers and records The Marquees, a Washington, DC-based vocal quartet that features a young Marvin Gaye. A young Hartley Peavey, later Founder and CEO of the Peavey Electronics Corporation, one of the largest audio equipment manufacturers in the world, is inspired to build his first amplifier after attending a BO DIDDLEY concert in Laurel, Mississippi. Influenced by guitarists including BO DIDDLEY, Chet Atkins, Chuck Berry and Les Paul, James Burton begins a distinguished career playing guitar in the bands of artists including John Denver, Ricky Nelson and Elvis Presley. He embarks on Alan Freed's "Rock & Roll Easter Jubilee of Stars" concert series at the Brooklyn Paramount Theater in New York, with artists including jimmy Bowen, The Cellos, The Cleftones, The Del Vikings, Anita Ellis, The G-Clefs, Charlie Gracie, The Harptones, Buddy Knox, Bobby Marchan, The Pearls, The Penguins, The Rhythm Jesters, The Rosebuds and The Solitaires. He performs a concert series at the Syria Mosque Theater in Pittsburgh, with artists including Ruth Brown, Ray Charles, The Charms, The Clovers, The G-Clefs, George Hamilton IV, Johnnie & Joe and The Moonglows. He embark's on Eli Weinberg's "Fantabulous Rock & Roll Show of 1957" tour, with artists including The 5 Satins, Ruth Brown, The Coasters, The Drifters, Johnny Heartsman, Smiley Lewis, The Schoolboys, The Spence Twins and the Paul Williams Orchestra. He appears on Dr. Jive's "Labor Day Week Show" concert series at the Apollo Theater in New York, with artists including Lee Andrews & The Hearts, Big Maybelle, The Cookies, Fats Domino, The Harptones, Little Joe & The Thrillers and the Reuben Phillips Orchestra. He embarks on the "Biggest Show of Stars For 1957" tour, with artists including Chuck Berry, The Drifters, The Everly Brothers, Buddy Holly & The Crickets, Frankie Lymon & The Teenagers and Clyde McPhatter. He embark's on another of Eli Weinberg's "Fantabulous Rock & Roll Show of 1957" tours, with artists including Nappy Brown, Roy Brown, Ray Charles, The Del Vikings, Annie Larie, Mickey & Sylvia, The Moonglows, Tiny Topsy, Big Joe Turner, The Velours and Larry Williams. He ends the year playing on Dr. Jive's "Christmas Week Show" concert series at the Apollo Theater, with artists including Big Maybelle, Priscilla Bowman, The Dells, The Deltairs, The Drifters, Screamin' Jay Hawkins, Mally & Margot, The Moonglows and the Reuben Phillips Orchestra. Chess Records release his debut LP "Bo Diddley". Pop/folk singer Jimmie Rodgers enjoys a Canadian Top 40 hit with an adaptation of his song "Bo Diddley". The Johnny Otis Show's "Willie & The Hand Jive", with its BO DIDDLEY beat, is a hit for them and for Sir Cliff Richard in 1960 and for Eric Clapton in 1974. Influenced by artists including BO DIDDLEY and Conway Twitty, The Band's drummer and vocalist Levon Helm joins Ronnie Hawkins & The Hawks. He embarks on the "Biggest Show of Stars For 1958" tour. He embarks on the "Big Rhythm & Blues Cavalcade of 1958" tour, with artists including Etta James and Little Willie John. He records his song "Bo Meets The Monster", which each Hallowe'en becomes a staple of rock & roll Oldies format radio station playlists and is later included in the About.com Oldies website listing of "Top 10 Hallowe'en Oldies". He embarks on Alan Freed's "Christmas Rock & Roll Spectacular" concert series at the Manhattan Loew's State Theater in New York, with artists including Frankie Avalon, Chuck Berry, Eddie Cochran, The Everly Brothers, The Moonglows, Johnnie Ray and Jackie Wilson. Ritchie Valens is later added to the bill and is inspired to write and record an untitled guitar instrumental after watching BO DIDDLEY's performances. "Say Man" reaches the US Top 20; his biggest US pop chart hit. The title and lyrics of "Say Man" are later briefly referenced in singer Jimmy Soul's 1963 chart-topper "If You Wanna Be Happy". Checker Records release his second LP "Go Bo Diddley". Buddy Holly's last recordings, taped on to his home tape recorder in his New York apartment less than a month before his death in a plane crash, include takes of his songs "Love Is Strange" and "Dearest". He embarks on the "Biggest Show of 1959" tour, with artists including Little Anthony & The Imperials, Jimmy Clanton, The Crests, Clyde McPhatter and The Platters. He embarks on the "Biggest Show of Stars For 1959" tour, with artists including LaVern Baker, The Coasters and Clyde McPhatter. He performs on the "Jocko Rocket Ship Show" at the Apollo Theater in New York, with artists including Jesse Belvin, The Cadillacs, Dave "Baby" Cortez, Bobby Day, The Fiestas, The Heartbeats, Joe Medlin, The Shirelles and The Spaniels. He appears at the First Annual Newport Folk Festival. He records his classic song "Road Runner". Australian rock pioneers Alan Dale & The Casuals enjoy a Top 40 hit down under with their covers of his song "Crackin' Up" and Chuck Berry's "Back In The USA". Influenced by artists including BO DIDDLEY, Chuck Berry and Elvis Presley, a young John Fogerty, later to find international acclaim as leader of the rock group Creedence Clearwater Revival, forms his first group, The Blue Velvets. The French singing star Johnny Hallyday records a version of his song "Love Is Strange". Jo-Ann Campbell's recording of his song "Mama (Can I Go Out Tonight)" is featured on the soundtrack of the movie "Go, Johnny, Go! ".